I haven't been keeping my Web site up to date like I should have, but then haven't been doing much on the O'day either. I did build a whisker pole a couple of weeks ago and have an attachment bracket ordered from West Marine. So I have to get that fastened to the mast and the whisker pole is ready to go. 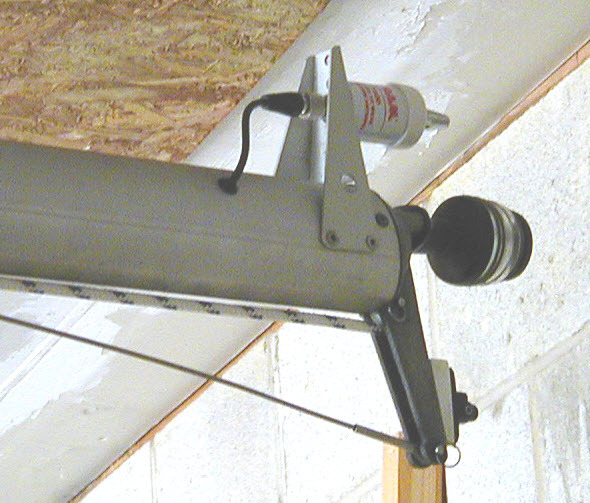 I also have to mast light connector to install. That's on order at West Marine. Hope to install it this weekend. I actually have a two pole connector that I ordered a couple of years ago and then lost. I just found it over the weekend but I think I'll wait to get the four pole connector since there are actually three wires (and I have to figure out what the three wires are for). The issue that is giving me some heart burn is a loose shroud anchor grommet. 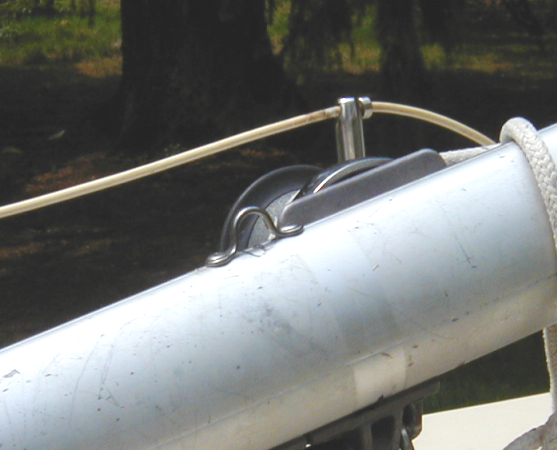 O'day has this method for the top of the shrouds and forestay to make a quick connection to the mast. 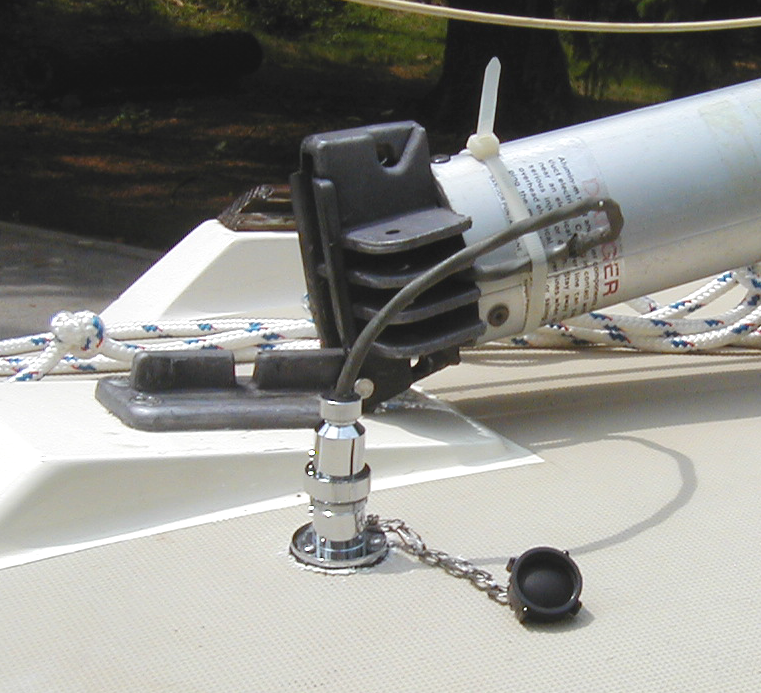 It does make it easy to take the shrouds and forestay loose from the mast. The only problem is, the top shrouds go through the spreaders that have a rubber boot, so you can't easily take them loose there. So three of the five (top and bottom shrouds and forestay) can't be taken off the mast anyway. 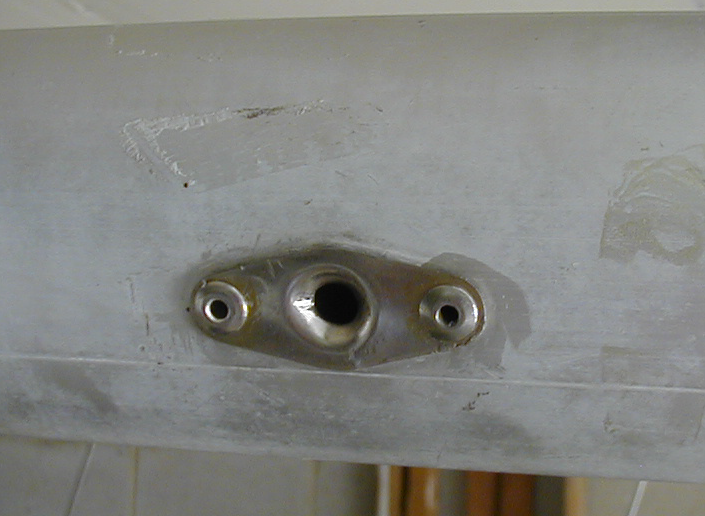 Also, you have to be very careful when raising the mast to make sure the hooks are properly aligned in these grommets or they can bind up and cause real problems. So the problem is, one of these grommets is a little bit loose. I think the pop rivets are stretched, at least I hope that is the case. If the rivets aren't stretched then the hole in the aluminum mast are stretched, which would be worse. I guess I won't know until I grind the rivets off and get the grommet off the mast. The photo above shows the little bit of looseness of this grommet. 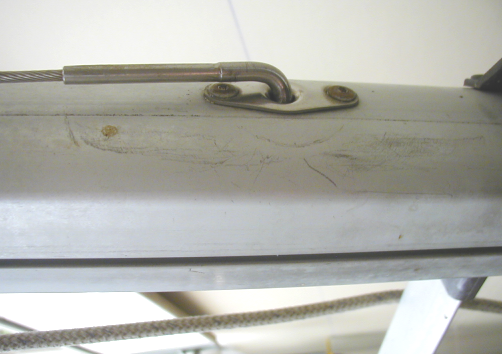 I'm concerned that if it isn't fixed, it will wear the rivet holes in the mast and things will get worse - much worse. Yesterday evening I got the rivets out of th grommet and got it off the mast. This shows how the grommet is warped. It's going to take some time and finesse to make this baby right again. This shows how the mounting holes are larger then the holes in the grommet. I don't understand why they did this. I intend to use a back up washer and fill the holes with epoxy when I put this all back together. How? 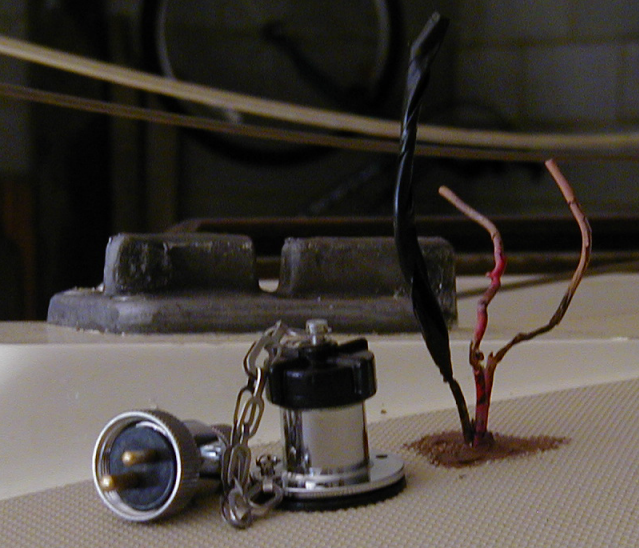 I will fish a cord through rivet hole and out the larger hole. Tie on a washer and put a little bit of epoxy on the washer so that when I pull it into place with the cord, it will stick to the inside of the mast. Once I have both washers in place, then I will fill the holes in the mast with some epoxy paste, and rivet the grommet in place. 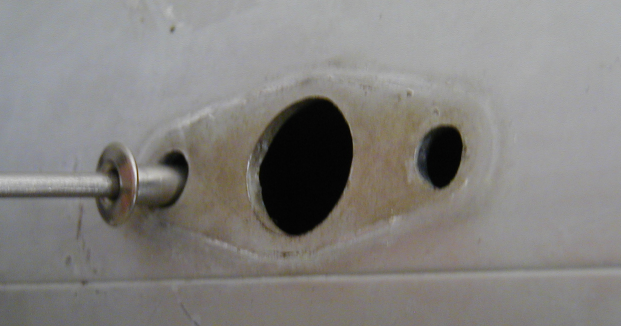 The idea being that the epoxy will make keep the rivets from moving around in the holes. One more challenge - I've got to figure a way to get the old rivets out of the mast. If they are magnetic, I can use a magnet, but being stainless, they may not be. Some stainless is magnetic and some isn't. Everything went as planned except I had problems with my pop rivet gun. I had to disassemble the blasted thing and cut off the rivet that was half way crimped. But I eventually got it done. Definitely time for a new pop rivet tool. I have an old Sears model from about 1978. I finished two projects today that I've had on the list for a long time. First was adding a bracket to the mast to anchor the whisker pole to. The second was getting the mast wiring connector installed. Finally ran the radio cable inside the mast. I've had this on the list for a long time. Glad to finally get it done.